Making lemonade out of lemons in Denmark (so to speak). “I strongly urge you to consider adding stock options to your investment strategy,” says wealth and income specialist Zach Scheidt. Sound advice… but only if you actually understand how stock options work. For Millard, the Robinhood app appealed to him for two reasons: First, “it’s a nice-looking thing that lives on your phone.” So a sleek, user-friendly app that’s convenient. Check. Second, Millard says: “Traditional brokerage firms such as TD Ameritrade or E-Trade charge a fee every time you buy or sell a stock; Robinhood doesn’t.” So no fees — also check. “The [Robinhood] app made investing seem not so different from a phone game,” he says. Danger, Will Robinson, er, Drew Millard! 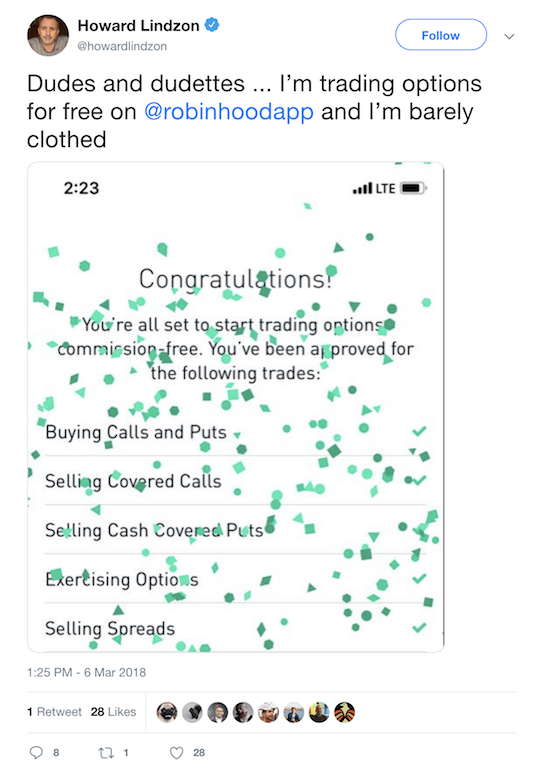 “Notably, Robinhood lets you trade ‘options’ with scarily little oversight,” Millard continues. Needless to say, our hapless Mr. Millard was out of his element and lost his lunch (we mean that literally — the guy’s a millennial) on the cheapest “call” option he could find, Under Armour for $19. “The fact that I only fully understood how this dangerous short-term financial product worked after I’d actually bought the thing probably means [it’s] a terrible idea for Robinhood to offer this as a service,” Millard concludes. Sure, blame it on “dangerous” options and Robinhood… sheesh. “On the other hand, few instruments on Wall Street offer as much profit potential in such a short amount of time, Zach says. First: “Stock options trade alongside stocks on the major exchanges,” Zach says. “But while stock shares represent part ownership in a company, options represent rights and obligations. At the time of writing, Apple shares are trading for $172.14, by the way. “But with the market’s volatility, he’s not willing to stake a large amount of cash on his analysis.” So the trader turns to the options market instead. “He can buy a call option on Apple with a $175 strike price that expires in January 2020. “If he buys it now, he’ll pay just $15 a share for the contract. “Since each option represents 100 shares of stock,” Zach says, “it means shelling out $1,500 — far less than the $19,000 he’d have to pay if he bought the shares outright. “With the option, he has the right to buy 100 shares of Apple stock for $175 — no matter what they’re currently selling for. If the trader’s analysis winds up being wrong — Apple never gets above $175 by January 2020 — his option expires worthless. “Let’s say you’re holding 1,000 shares of Apple (AAPL) right now that you paid around $118 a share for,” Zach says. “So you could sell call options against your Apple stock,” Zach says. “You essentially create a contract saying that you’re willing to sell 100 shares of Apple at the option’s strike price anytime before the option expires. “In this example, the strike price is $175 and the option expires in January 2020. The option buyer pays you $1,500 to keep your promise. First: “If Apple ever tops $175 a share, the person who bought your promise — the call option — could ask you to fulfill its terms. That’s not so bad… really! Third: “And if the option expires worthless, you get to keep the $1,500 you received for selling the option. “So selling calls against your stock shares is a great way to earn income in up-and-down markets,” Zach says. “During upturns, you can sell shares for a nice profit,” he continues, “and you can keep cash rolling in when the stock market heads south. [Ed. note: Everything we’ve just described is the easiest way we’ve ever found for you to make an extra $2,000 per month. In fact, we’re so confident that you can make — at least — $2,000 per month if you follow the strategy outlined on this page… that… our executive director guarantees it. Yes! We’re guaranteeing you will be shown how to make a minimum of $2,000 a month using this strategy. I cannot guarantee how long our publisher will allow us to keep this video online. And there’s more green… the S&P 500’s up 16 points, to 2,791, while the Nasdaq’s up almost 60 points, to 7,518.5. As for commodities, a barrel of WTI is selling for $57.29, up 33 cents so far today; gold’s gained $5.80, to $1,333.60 per ounce. Checking on crypto — bitcoin’s up $23.71, to $3,927; bitcoin just can’t crack that $4,000 resistance level. Yet. Last week, we reported California’s Gov. Gavin Newsom was finally throwing in the towel on Jerry Brown’s pipe dream — a bullet train connecting San Francisco to Los Angeles. 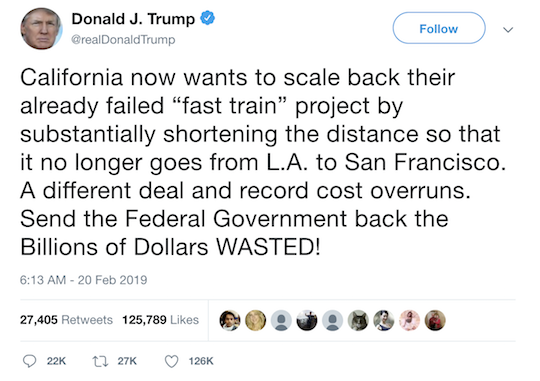 However, in order to keep federal money — totalling $3.5 billion — Newsom had opted to complete a seriously truncated train connecting Bakersfield with the Central Valley. But now the project might be scrapped entirely: “The feds (and a gloating President Donald Trump) are swooping in to try to get their money back,” Reason says. In a letter sent Wednesday, the Federal Railroad Administration (FRA) informed the state it would be cancelling “$900 million in federal funds set aside to assist in the construction of the Central Valley portion of the route.” Unless the state of California can make a case that the shortened train conforms to original bullet train plans. Prevailing wisdom says that Alzheimer’s disease is caused by beta amyloid protein plaques that damage healthy brain tissue; that’s led researchers at Roche/Genentech to create the drug crenezumab… that unfortunately failed in third-stage clinical trials. “Biotechs and Big Pharmas alike have failed again and again,” Ray says. “It could be that we fundamentally don’t understand this disease yet. “Clear out the plaques and you stop the progression of Alzheimer’s, the theory goes,” he continues. “But crenezumab’s failure is more evidence that this theory isn’t holding up very well against cold reality. Alternative treatments… and alternative theories. And targeted therapy “should allow for higher dosing and greater clearance of toxic species of this protein,” says Ray. “Another neuroscience biotech… is taking a completely different approach to Alzheimer’s. “Instead of going after protein plaques,” Ray says, “[the company] has developed a platform designed to alter the inflammation-signaling cascade in stressed brain cells.” All of this, aimed at reducing brain cell death, or apoptosis. An effective Alzheimer’s drug that does more than just mask symptoms but actually delays the disease’s progression (or even provides a cure!) “would almost instantly become one of the best-selling drugs of all time. Ray’s got the inside scoop on an extraordinary neurotech breakthrough: Shares of this tiny West Coast startup might skyrocket. And company insiders have already gobbled up 11,843,747 shares of the company’s stock… in a single day. Hmm… what’s to be done about a mountain-size heap of garbage within city limits? 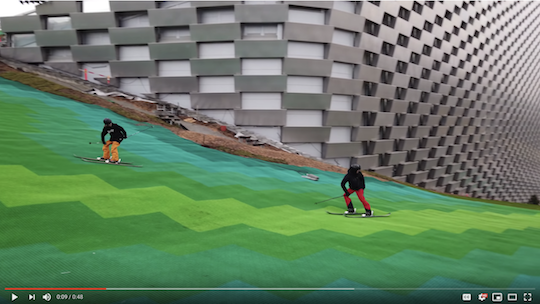 If you’re in Copenhagen, the answer’s obvious: Ski down it. The plant started operating in 2017 and is a giant leap forward for the country as it tries to become the world’s first carbon-neutral capital. As for the recreational slope, it opens to the public year-round come spring. “It’s a slightly different experience than to skiing in real snow,” says ski enthusiast Tommy Christensen, who’s already tried out the slope. We’re assuming he’s a ski enthusiast and not a waste-treatment enthusiast. But… to each his own. Now for the real question: What to name this “trashy” ski slope? Our fave? The Clutterhorn. P.S. We’re so confident that you can make — at least — $2,000 per month if you follow the strategy outlined on this page that Agora’s executive publisher guarantees it. It’s a strategy he’s been using in his own account for years and — it’s so simple — he did a live demo showing an 8-year-old child how to use it. We’re guaranteeing we will show you how to make a minimum of $2,000 a month using this strategy… but we can’t guarantee the page will be up for long.